If music be the food of love, play on… Nothing creates an atmosphere or sets a mood as music does, so don’t leave the choice of your wedding music to others. As well as two or three hymns or psalms, there will be music as the guests arrive, for the bride’s procession down the aisle (the processional), while you’re signing the register and as the newlyweds leave the church (the recessional). If you already have an idea of what you want, speak to the minister about it at your first meeting. If you haven’t he or she will be able to suggest some ideas and arrange for you to meet the organist, when you can go into more detail. Unless you’re having a choir, it’s a good idea to choose hymns your guests will know, but when it comes to the rest of the music, you can choose what really moves you. The organist will start to play about twenty minutes before the ceremony is due to start and the music should be calm and gentle, to welcome your guests into the church and set a solemn and dignified mood. As the bride arrives with her father to begin the procession down the aisle, the music announces her arrival and lifts the mood. During the signing of the register, the organist will play again – or the choir or a soloist will sing. Then, after the blessings, comes the musical climax to which everything has been building – a joyful explosion of sound to celebrate the marriage. The most important thing to remember about music and readings for a civil ceremony is that they must not contain any religious references, whether you are getting married in a register office or in an approved venue. However, it’s still important to create the mood and you should check with the registrar when music will be permitted and how it can be played. Usually a register office can only accommodate recorded music, but live music can usually be accommodated by approved premises, from a solo harpist or guitarist to a string quartet. The same guidelines to your choice of music apply as in a religious ceremony, but modern music is also a common choice. Choose music that means a lot to you as a couple or go for perennial favourites from Louis Armstrong’s It’s a Wonderful World to Elvis Presley’s Love Me Tender or Carole King’s You’ve Got a Friend. Take time to read some love poems and love letters which you may like to choose as readings – from Shakespeare’s Shall I Compare Thee to a Summer Day to Elizabeth Barrett Browning’s How Do I Love Thee, Let Me Count the Ways. 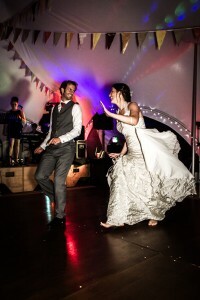 Guests can feel at a bit of a loose end as they arrive at the reception, while you and your immediate family are off having all those photographs taken and you can find entertainers who will break the ice and get everybody talking. If you’re having an evening celebration, with dancing, remember this is the one occasion when you have to please all ages, from Grandmas to teenagers, so try to choose entertainment which will get everybody on the floor. Most discos offer a wide range of music – but you will have to ask the DJ for exactly what you want. Do choose the song for your first dance together as husband and wife and if your partner has two left feet, see if you can organise some dancing lessons beforehand. In fact, if he has two irretrievably left feet, what about a barn dance or a ceilidh? They’re great fun and everybody can join in. Do try to see the performers at work before you book your music and entertainment `– everybody sound good on the phone or on paper, but you want to be sure your entertainers are able to provide exactly what you require. 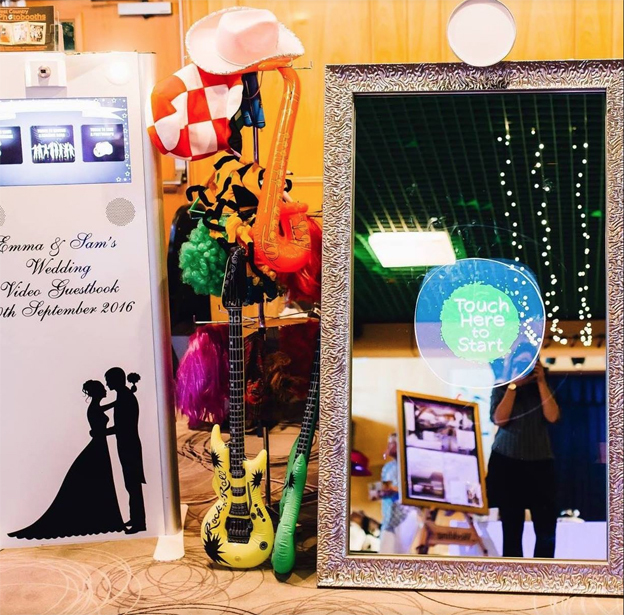 Choose a free-standing slimline selfie pod, where your guests can simply use the touch screen buttons to record video messages, take photos and record their own video karaoke selfie or a Magic Mirror Photobooth, a fantastic alternative to the traditional photobooth, which leads you through the fun and you can even have the option for a screaming contest as well as signing the mirror before your photo is printed. Guaranteed fun for every wedding party!